John Wiley & Sons, 9781118653661, 192pp. Author Scott Leonard is a successful business professional who adapted his business to allow him to achieve his goals and live his dreams now--while still working in the business he loves. His experience is an inspiring example of extreme work-life empowerment that can help you whether you're the owner of a business or just want more freedom and flexibility in your career. Now, in The Liberated CEO, Leonard shares his story and strategies with you. 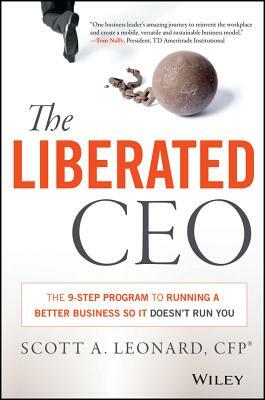 Engaging and accessible, The Liberated CEO is about developing a business model that empowers business owners and key executives to perform--and live--at the highest level. SCOTT A. LEONARD, CFP, is the founding partner of Navigoe, LLC, a leading, full-service wealth management and investment advisory firm. He has a degree in Economics from UCLA. Mr. Leonard has been an instructor at UCLA Extension, teaching courses in the financial planning certificate program. He was the Dean of the School of Investments for NAPFA University, and is a national speaker on topics addressing investments, wealth management and business best practices. Mr. Leonard is a frequently published author, specializing in advanced investment theory, and has been the featured financial planner for the Los Angeles Times weekly "Money Makeover" column. He is often looked to by the media as an expert in a breadth of financial, business and entrepreneurial topics. Away from the business, Mr. Leonard is busy working with his wife helping to raise their three boys and acclimate to the U.S. after spending 2 1/2 years sailing the world with his family.